Welcome to Episode 205, an inside look to the audio engine here in the Land of Bula. That Zoom H6 (pictured above) is the latest addition to the studio. It’s an incredible piece of equipment, capable of more than a single digital recorder ought to be capable of. Thanks to Patrick (my rep) at Sweetwater Sound, I got it about a month ago. 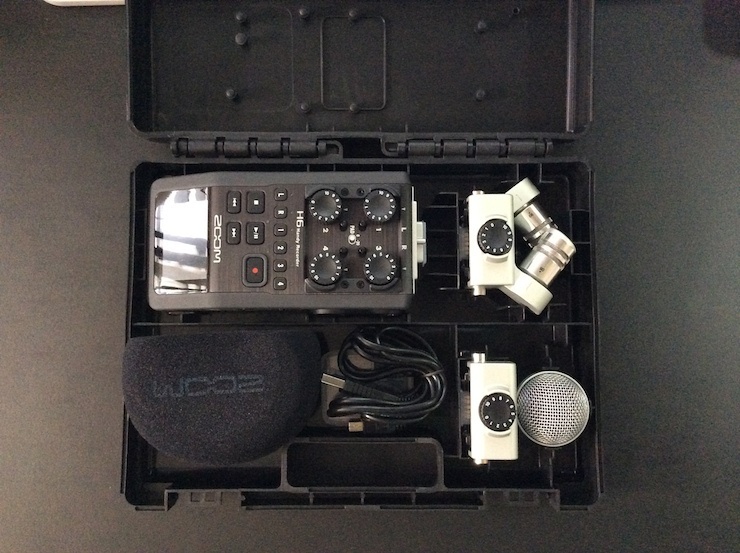 The unit comes with this hard shell case (notice the nice hinge system – it ain’t flimsy), a windscreen, a USB cable, two microphone interfaces and a small capacity SD card. I wish it had come with an AC power adaptor (an additional $24 or so by itself, or an additional $55 or so if you get it along with a bunch of other unnecessary accessories). This unit will serve as a multi-channel digital recorder, but it also serves as a USB interface. It has 4 XLR/TRS hybrid inputs, each with its own individual pots. I’ve yet to record with it (other than a short test recording). The full color display is angled (as you can probably see by the photo) making it easy to see. It’s a solidly built unit with a rubberized outer surface. The reason I was looking for a new unit was because my Roland R-09HR is growing increasingly unreliable due to lots of use. It’s been a great unit, but I was also looking for a unit with XLR/TRS inputs…and a unit capable of providing phantom power for my Rode NTG-2 (which can also be powered by AA batteries). But let’s go back a bit, shall we? Episode 76 was the first go round of giving folks a peek inside The Yellow Studio. Numerically, that was 130 episodes, but there are many unnumbered episodes. And there are other podcasts that have come out of The Yellow Studio. I confess that not much has changed over the years, but I also know how geeky we podcasters can be. I love to see studios. And find out what gear people are using, and how they’re using it. I know you’d like some logical approach to knowing more about The Yellow Studio. For starters, let’s talk about the name. Just look at the photo gallery and you’ll see the color of the walls. People often ask, “Why yellow?” Why not? Truth is, I love yellow, orange, red and hunter green. Those are among my favorite colors. I don’t have just one. 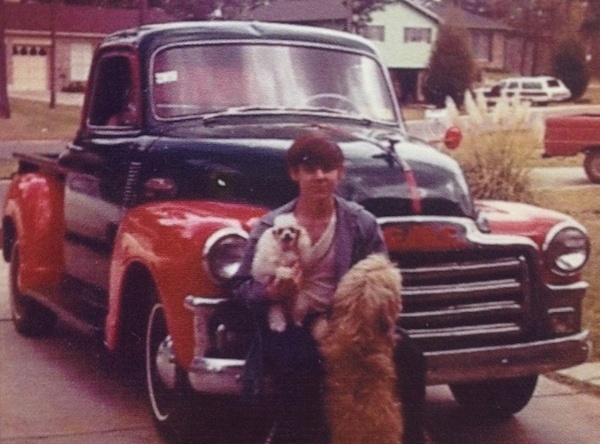 When I was 15 – yes, people, when I was young, living in Louisiana…you could get your driver’s license at 15 – I had a 1954 GMC pickup truck. It was an old truck some farmer had abandoned in a field. My maternal grandfather bought it for $150 and got it running, then paid somebody a little bit to recover the seat in new vinyl. It was a “3-on-the-tree” transmission and I drove it back from Oklahoma, where my grandparents lived, all the way back to Louisiana. No air conditioning. No radio. Bare bones classic truck in faded hunter green. During high school I had great fun with that truck. My first “real” car was a Pontiac Lemans. It was “Sundance Orange” – that’s what GM called it. So orange was always a big player for me. So, why not The Orange Studio? I never considered walls being orange. Frankly, it just seemed too dark and I wanted something lighter. I had a moment of clarity when the TV show HOUSE aired. His boss, Cuddy, had yellow walls in her office. Mustard yellow. The exact shade I knew I wanted when I first “built” the Yellow Studio. Of course, it wasn’t so named at the time. The moment I saw Cuddy’s office I told my wife, “That’s the color I want to paint the walls.” She and Dena, a close friend, painted it after finding the right shade of yellow. So that’s how the name came to be. What else about the physical space? – It’s a room about 13′ x 14.5′. – There’s an adjoining bathroom. – It has a small closet, filled with too many cables and other audio paraphernalia. – It has 2 large windows with wooden slat shutters on the inside. – It has an overhead florescent light, which rarely gets turned on. – There are 4 full height bookcases behind my desk (out of seen most of the time) filled with books. – There are 3 other 5′ high bookcases in the studio, also filled with books. – There is one 4′ high bookcase filled with books, and a Polk Audio HD clock radio, plus a 3 monkeys lamp (hear no evil, see no evil, speak no evil). – There is a CD carousel in the corner that houses 2000 CD’s with more stashed here and there. – There’s one 2-drawer lowboy filing cabinet (lateral files or regular – it can configured either way). – There’s 3 chairs that can sit around the “broadcast table” which is actually a conference table. – The floor is carpeted with a light green low plush carpet. – The ceiling has popcorn texture circa 1980’s (yeah, I hate it but it’s a royal pain and major mess to change it). – The room has one HVAC vent without a vent fixture to prevent any rattling. Air just drops into the room. Okay, enough about the actual space. Now for the stuff you really care about. Today’s episodes may go deeper (and darker) than you want, but that’s what the STOP button is for, right? I hope you enjoyed the tour. Thanks for listening for all these years. I know the podcast here has morphed and changed over time, but that’s what we do as people. We grow. We change. Hopefully, we improve. I’m still working on it. Do you have a podcast? Let me know about it.